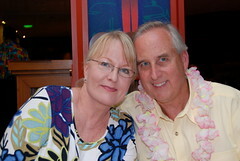 Saturday night (Nov 1st) we stayed at the Hilton at Cocoa Beach. The Hilton lets you leave your car there while you’re on the cruise. Then you take a shuttle from the Hilton to the port. If you park at the port you have to pay $15 a day. So we saved some money! While Mom & I were getting dressed Papa & CSP went to Publix to pick up breakfast for us. CSP looooves him some Publix. Publix people, if you’re reading, please open some stores in Charlotte so CSP can work for you. 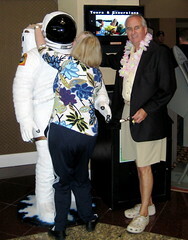 The Hilton has a spaceman in the lobby so we got in a quick photo op while we waited for the shuttle. Note Papa is still sporting his lei from the Polynesian. The shuttle picked us up and we all got so excited as we headed for the port! Let me tell you, I’ve been on many cruises (this was #9) and I have NEVER had such an easy peasy embarkation process as Disney provided. We were on that ship in no time. And everyone is just so helpful and friendly! Check in was a breeze! Lisa had us all wear our bridesmaid t-shirts and all the crew kept commenting on it. Then just as you’re about to board the ship a little man asked us our family name and where were we from. He then turned to the lobby and announced into his microphone “Disney cruise line would like to welcome the M***** family from North Carolina!! !” and all the crew in the lobby literally started cheering and jumping up and down for us. It was so great! What an entrance! We went up on deck 9 to the welcome buffet. It was raining but that didn’t stop a bunch of kids from jumping in the Mickey pool! The deck was slippery and not 5 minutes after getting on that ship- down I went. I did the splits and landed on my right knee while twisting my left knee pretty good. What a way to get my skirt all wet and start the cruise in pain and tears! Ugh! So we sat down at a table while Papa & Gigi brought us food and drinks. They saw a waiter carrying a tray of Bahama Mamas and grabbed 4 and took off. They didn’t know you have to pay for cocktails! The waiter chased them down and got them to pay. After lunch we went to check out our staterooms. 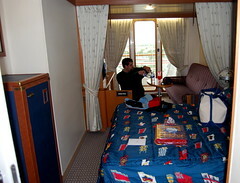 We had adjoining staterooms with balconies. So nice! 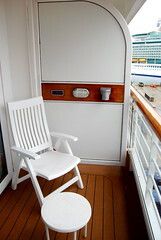 The nicest staterooms I’ve ever seen, that’s for sure! CSP wasted no time and started unpacking his beer. Then it was time for the mustard drill. Or mustar, muster? I can’t imagine they call it the mustard drill, but anyway, you have to put on your life jacket and meet up at the life boats. That’s when I finally saw Lisa! I could tell she was crying. The little woman who was running our drill told me I could go talk to her. We hugged and she told me she was crying because she forgot to bring all of Pete’s shoes! Yikes! Luckily Pete & CSP are close to the same size so Pete could borrow Jon’s shoes. Crisis averted! After the mustard drill it was time to set sail! It was still raining so instead of going up on deck we made some cocktails and hung out on the balconies. Disney had people waving bon voyage to the ship with their big Mickey gloves! It was fun hanging out on the verandahs watching the land disappear. There were 2 other ships at port that day, one from Carnival and one from Royal Caribbean. My Nanny was on the Royal Caribbean ship on a cruise that same week! We saw her ship as it sailed off to the Bahamas. We freshened up for dinner after unpacking. Dinner the first night was at Parrot Cay. Dinner was great. It was good to see everyone in our party again. After dinner the boys headed to the sports bar while Gigi and I went to see Beverly Hills Chihuahua. It was so cute! We couldn’t believe it when we got back to our rooms that we were “out” later than the boys- they were fast asleep! More pics here. I love these posts. I’m living vicariously through you with them. It is my dream to go on a Disney Cruise someday. 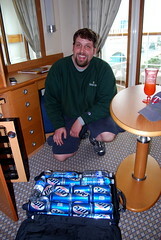 I laughed out loud at CSP and his suitcase of beer. My husband even asked me what what so funny and I showed him the picture. Too funny! wow, you’ve got me all wanting to go on a disney cruise now! oh, and your hair looks great. i really like the cut and the color. did csp drink the entire suitcase of beer? Except for the fall of course it seemed like a great time. I hope you are OK! Word to Publix! 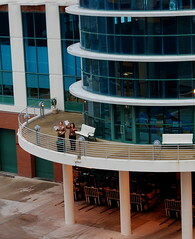 We shop there whenever we go to SanDestin. OMGosh! I can not wait to show Marc that picture of the beer! LOL! That beer is tooooo funny! 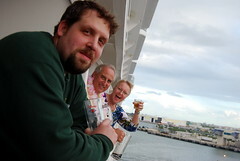 I had no idea you could BYOB on Disney Cruises! I love seeing your pictures and hearing about your adventure. Aren’t Disney Cruises the best? I loved everything about it!